Tahoe Donner is a quintessential mountain community that is home to both locals and second homeowners. Located above the hum of downtown Truckee, community members enjoy a pristine location near Truckee, several ski resorts, and have easy access to the I-80 freeway. Tahoe Donner has a variety of amenities, including its own ski hill, for skiers of all skill levels; a golf course, that entwines itself into the community that is full of equestrian centers; fitness facilities; and pools. Plus, private beach access at Donner Lake. The mountainous community is surrounded by a fragrant forest made up of pine trees and wild flowers. While it is the largest suburb of Truckee, one would never know it because of the beautiful nature that surrounds it. The streets are calm and peaceful as they wind in and out of the hillside. 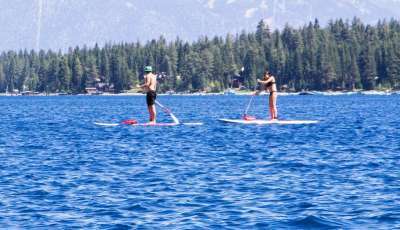 The Tahoe Donner Marina at Donner Lake has its own beach bar/restaurant and vendors to rent paddle boards, kayaks, and other water sports equipment. This community is perfect for all residents with different lifestyles as it is home to quaint cabins and mountain mansions. The area is safe, clean, and secluded without being too far from anything. People who live in Tahoe Donner are like all people who live in the Sierra’s, they appreciate both ruggedness and peacefulness that comes with living in the mountains.